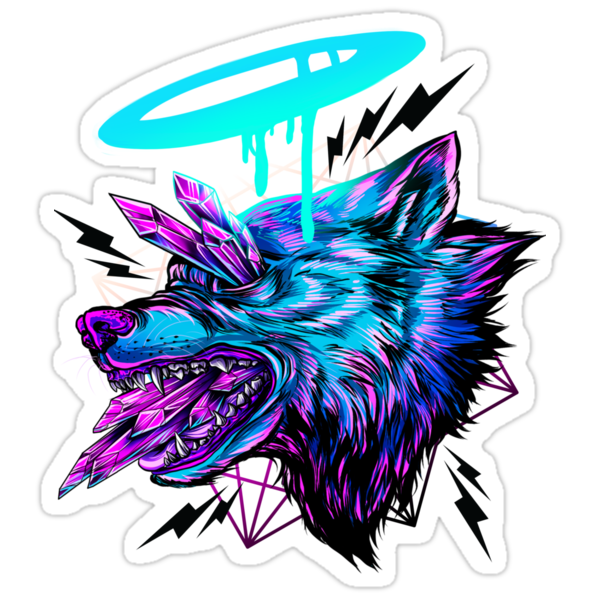 In order to optimize your designs for shirts and stickers, one of the most important things is to have a transparent background. This will allow your designs to have a more exciting look, and for stickers it will give them that snazzy die-cut border. 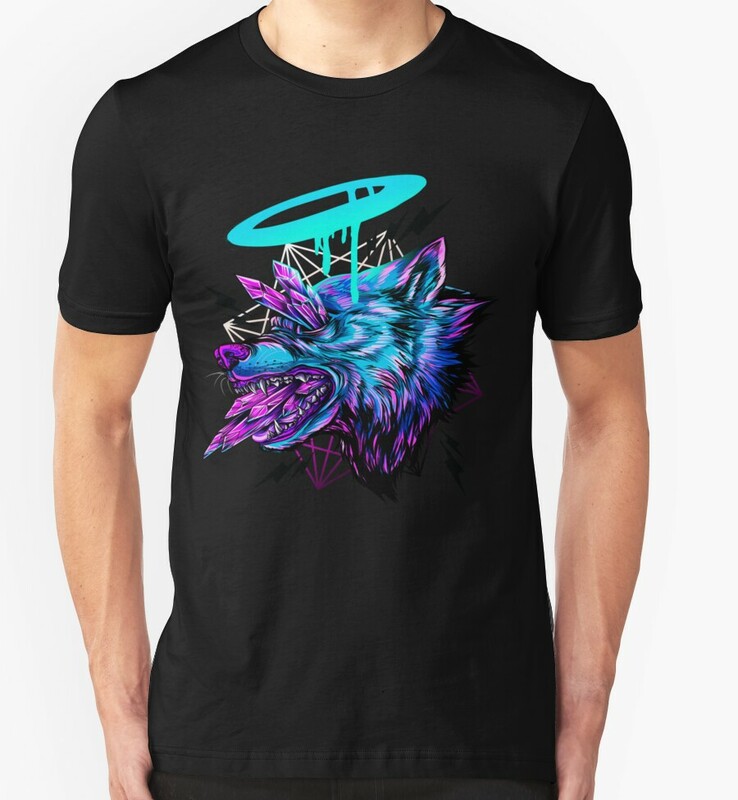 In the style of our recent post on Tips on Designing for T-Shirts, we wanted to share a few methods for how to extract your work from a background so that can get transparency where you need it. Ideally, you prepare your digital works in a non-destructive manner, and in that create new layers for new elements, shapes, or even colors. This way you can simply hide the background layer and export the main artwork with a transparent background. However, not everyone works that way, or the finished design might have been scanned in or even created in another program that’s not so easy to design in layers. 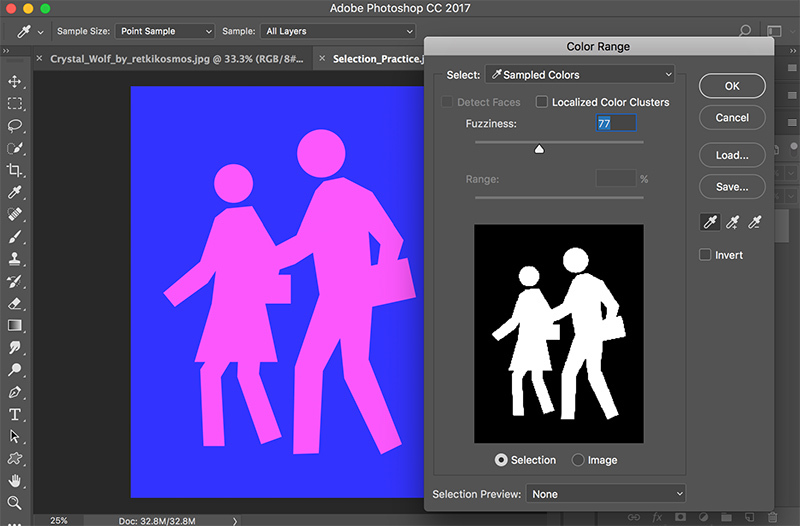 So, it’s important to know how to extract the work from the background layer so you can optimize the file for use as stickers, shirts, or other products that allow you to change the background color inside of our handy uploader. There are many ways to isolate elements of your design in order to extract them onto a new layer, and this can be different for each type of design. So, we’re just going to focus on a few here from within Photoshop. In the following examples, I use a simple two-color design to show how each method works. If you have a design with large areas of solid color, or a design that has sharp distinctions between colors, the first two methods you might want to try are the Quick Selection and Magic Wand Tools. The Magic Wand tool is one of the oldest tools in Photoshop, and makes selections based on tone and color. It’s one of those that is often forgotten as there are newer selection tools that may seem more intuitive, however the Magic Wand tool has some features that allow you to adjust what you are selecting, such as tolerance, sample size, and the new Select and Mask feature. You will also notice icons at the top that allow you to Add, Subtract, and Intersect the selection. In the image below I simply used the Magic Wand tool to select the pink colors. The quick selection tool works like a brush tool. You can change the size of the brush, and add and subtract areas of the selection. This tool is great as you can paint what you want to mask out – for example in the image below I painted the dark blue area with the Quick Selection tool. It works in the same manner when you want to cut a figure out of a relatively white background. If you have a specific area of color you wish to select, and don’t want to worry about extra pixels being selected, the tools mentioned above are perfect. However, another great methods that deals with the entire image, is to make selections based on color range. You get to this tool by clicking ‘Select>Color Range’, then can make adjustments from the popup that appears. From there you can use an eyedropper to make selections or even use the drop down to choose a specific color or tone. You can easily add and subtract to your selection, and use the Fuzziness slider to choose the range of colors in the selection. There are some great tools in this method so play around and get familiar with them. Clicking “OK” takes you back to your work with the selection active. Now you can copy your selection to a new layer, which works the same for each of the methods described here. Ok, let’s say you have a selection but there’s still a little bit of fine tuning needed. There are often little areas of pixels that you just can’t seem to include, or even really complex areas of color and value that make it hard to use the above tools with no further adjustments. This is a perfect time to refine your selections with a mask. The first way to do this, while your selection is active, is to go into Quick Mask mode by pressing the shortcut ‘Q’. You will notice your image take on a red hue and now you can use your brush tool to paint areas into our out of your selection. Use black to paint areas you want to be excluded and white for area you want to be included. This is a great method as it allows you to use the paint brush and and get in to areas you want to select, adjust your brush size and get those intricate details as well. The next method involves going to the menu “Select” and then choosing “Select & Mask”. From this window you can use the quick selection tool, refine edge tool, brush tool, lasso tool, and many adjustments to allow you to really refine that selection. This method is perfect for when you have delicate areas you wish to extract, such as hair or areas that need a softer selection. It’s a good idea to practice each one of these methods, as you might need to use a variety of them depending on the complexity of the design. 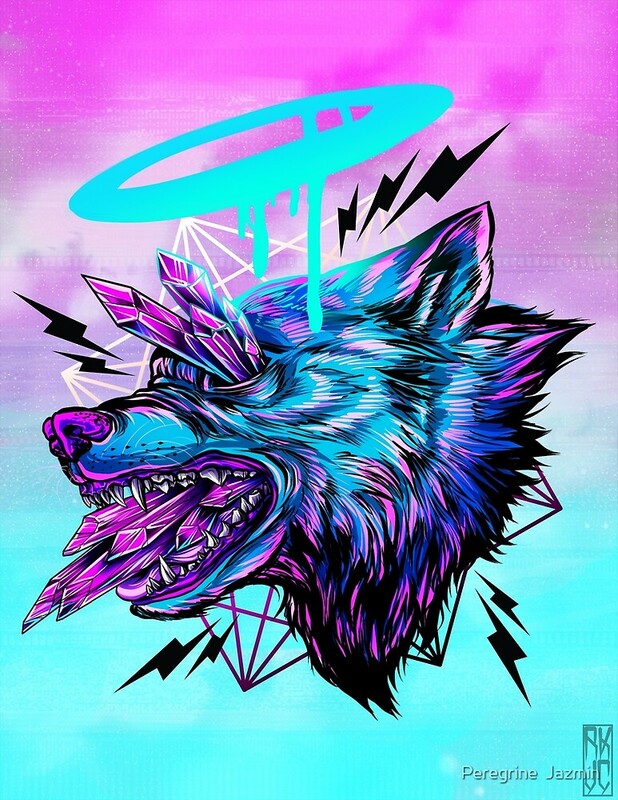 In the image below by retkikosmos, the background is filled with texture and contains many of the same colors that are featured in the main design. Using the Select by Color Range would be challenging, so this might be a good chance to start with the Quick Selection tool, go into Quick Mask mode to paint and refine, and then finish up using the “Select and Mask” method. 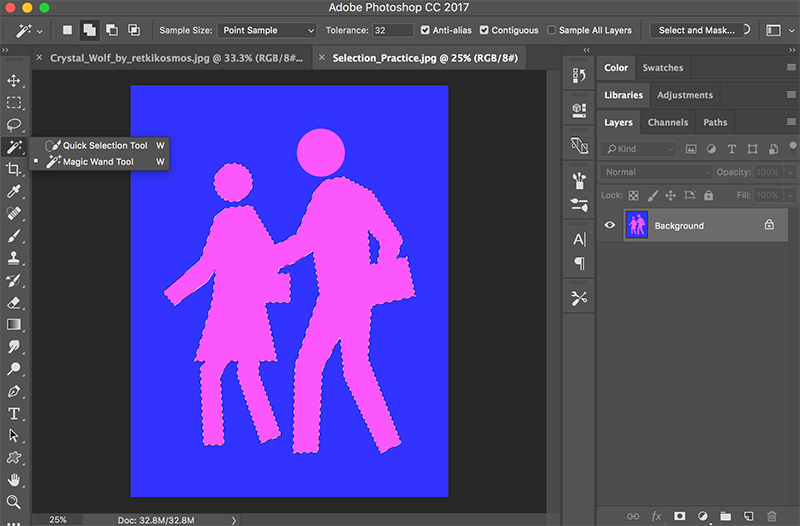 Once you get your design extracted onto a new layer, remember to clean up any stray pixels. 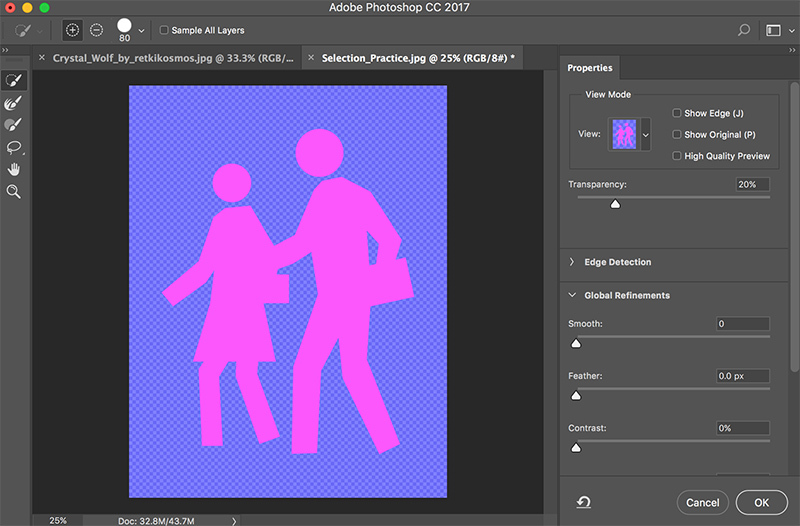 Filling a layer with a bright green color underneath will quickly show you any stray pixels needing to be removed. 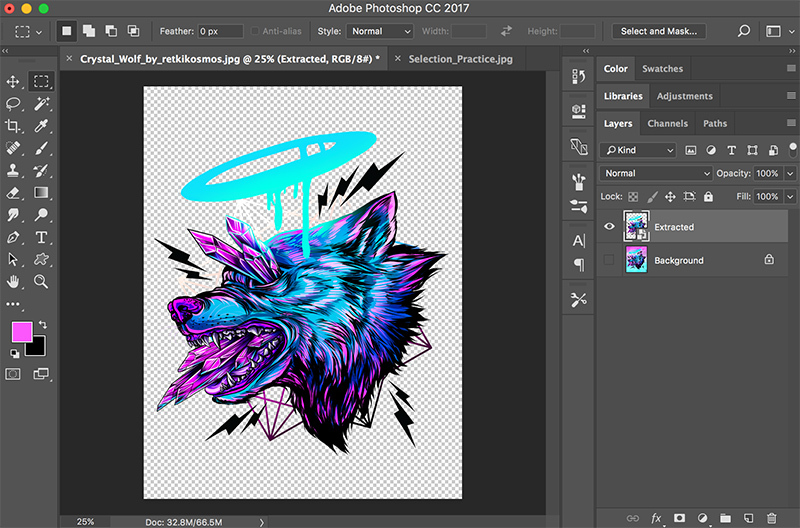 Delete that layer, save your PNG with a transparent background, and add the new design to your portfolio. Try these selection methods out and share any tips you have in the comments below.